The Hefty Holder is designed to securely hold the largest cases for all iPhones, Androids and others. Compatible with Otterbox, Lifeproof, and other devices/cases up to: MAX 6.9" (h) x 3.7" (w) x 0.7" (d) MIN 5.25" (h) x 3.25" (w) x 0.5" (d) Don't waste time prying your smartphone out of bulky holders or changing between cycling specific phone cases. 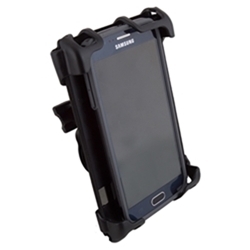 The Smartphone Holder features a durable elasticated bungee for easy in/out access of your device. Although engineered to withstand heavy road vibrations and other bumps, the secure bungee is still stretch friendly. We understand that your handlebars are very precious real estate. That is why we include a stem cap and handlebar mounting bracket with each Smartphone Holder. A clever ratcheting system on each mounting bracket allows you to adjust the viewing angle of your device.